“Star Clown, is the first serigraph in a series of clowns and the circus, revisiting imagery originally created as either watercolor or acrylic paintings from 1982 through 1988. I am bringing these painting to life again one at a time, reimagining them as hand-printed limited edition serigraphs. My hope is to create ten editions in this series. -Robert D. Pelton, The Trickster in West Africa. Swanson’s angelic clown stands in a golden circle, illuminated - showered in twin beams of light from above. A star tops his conical hat. This clown is our shaman, innocent and filled with bliss. A clown performs before an audience the scenarios that reenact all the foibles of life as a comedic show and through his antics, all of humanity’s suffering- the striving, the toil, the loss - is transformed into laughter and joy. In every culture throughout human history, stories abound of the trickster in various guises as a sacred figure allowed by society to speak the truth, free from the rules and conventions or the binding stratification of social class. Paul Radin notes that, “many of trickster’s traits were perpetuated in the figure of the medieval jester, and have survived right up to the present day in the Punch-and-Judy plays and in the clown.” Farce, parody and laughter are all ways of "breaking the frame," of opening closed systems to allow new forms to evolve. Like the trickster, the clown and the fool stir things up; overturning the traditional order. The boundaries of the stage disappear when the clown leaps and somersaults into the audience delighting the crowd while defying the expected. The court jester lampoons the sycophant. He is the one who can make fun of the king for letting his people starve, the one with the power to bring the message of the mood of the common people before the king. A clown can speak the truth to power and still live. Repeatedly, tricksters cross the borders of this world into other realities to return with the stolen gifts from the gods for the rest of mankind to enjoy and reap their benefits. Says Lewis Hyde in his book, Trickster Makes This World, “Trickster is the mythic embodiment of ambiguity and ambivalence, doubleness and duplicity, contradiction and paradox”, and can thus be seen as the archetypal boundary-crosser. 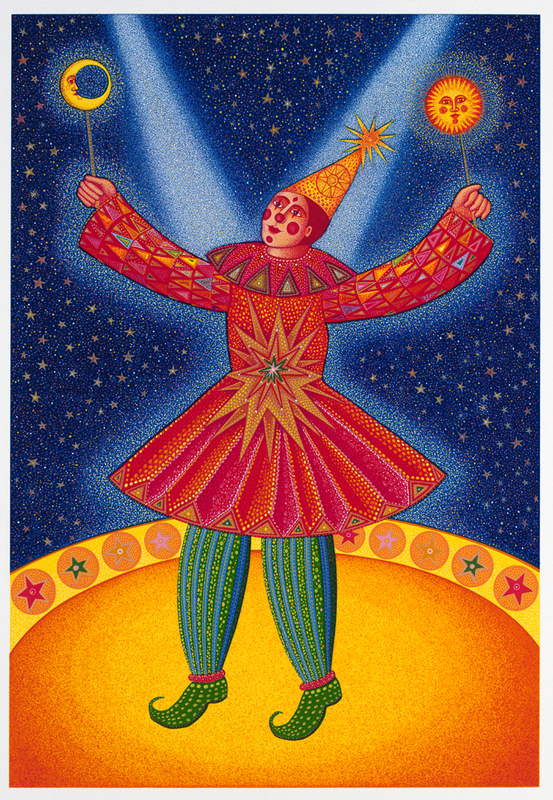 Star Clown holds aloft in each outstretched hand iconic representations of the moon and the sun. Night and day are opposites, yet the clown stands between them, holding both yet bound by neither. With the innocence and bliss of a child, the fool is the artist standing astride the dualistic contradictions of this world: between wealth and impoverishment, freedom and imprisonment, imagination and reality, the Earth and the heavens. 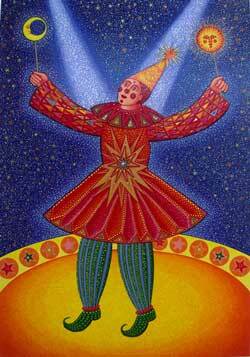 STAR CLOWN depicts a mystical encounter between a beatific clown and the heavens. Swanson’s rich stippling effects in thirty-one distinct layers of color portray a clown bathed in the shimmering radiance of the cosmos. Aurora Serigraphic Studio, Van Nuys, CA. Completed August, 2008. Dimensions: Image: 17½" x 12"